St. Anne’s is a Catholic Primary School reflecting the teachings of Jesus. It builds upon the multicultural traditions of the local community. 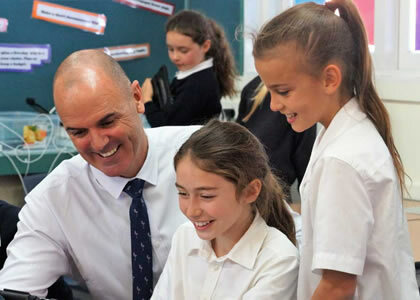 Within this environment, students are nurtured to develop individually as creative and responsible learners, with a love of truth, faith and knowledge. Nothing from Friday, Apr 19 to Friday, Apr 26. A reminder to Parents that winter uniform applies in Terms 2 & 3. Boys (Years 1 – 6) are required to wear long grey pants and Girls (Years 1 – 6), blue tights (or socks) with their tartan skirts. The school jumper must be worn with winter uniform and the sports jackets only to be worn on sports day. Students to be in Full Summer Uniform please. If you were unable to attend either of the Sacrament Enrolment Masses and wish to receive the Sacrament of Reconciliation, First Holy Communion or Confirmation this year, Fr Jess will accept enrolments at weekend Masses this Saturday, 6th April at 6pm or Sunday, 7th April at 8.30am. Looking for more information on St Anne’s School in Harvey?